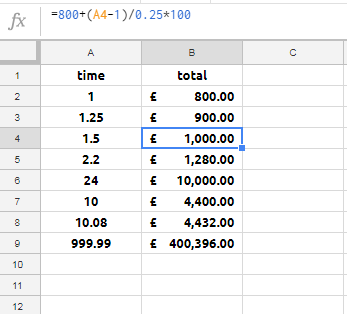 I am working with a fee sheet that goes up in $ increments based on time and I would like Google Sheets to do the math to calculate the cost based on the time entered into a cell. I would like to enter the time in one cell and have the sheet calculate the cost into another cell. What formula would I use to calculate monthly cost?